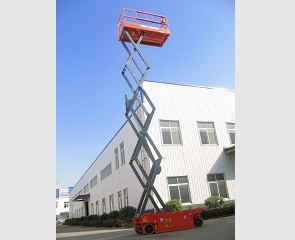 GTJZ0812 Self-propelled hydraulic scissor lifts are mostly applied to flat indoor or outdoor. The body is pleasing to eye and flexible to operate. The main engine can travel and turn automatically. It features imported hydraulic components, explosion-proof pipe unit and emergency descending switch; hydraulically driven ascending, descending and travelling function; low in noises and free of air pollution; durable, chip-free, skid-proof and traceless tires without scratching the ground; optimized product control mode and procedure with the premise of safety, bringing much more humanized operation. 1. Small turning radius: The outside turning radius of the tires is 7.7 (2.35 m) and the inside turning radius is 0 ft (0 m). 2. Large load capacity: The maximal load capacity reaches 992 lbs (450kg).